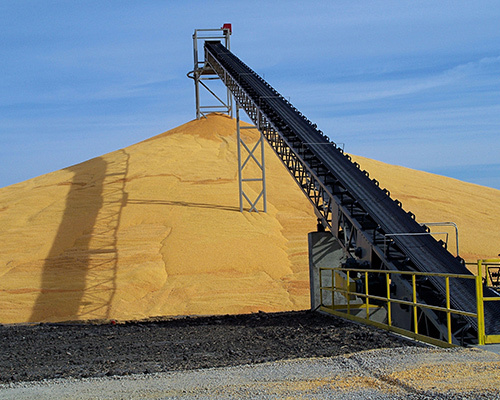 Harvesting, processing, grading and packaging are the major areas where the automatic material handling system is paramount to increase the productivity of the grain industries, wherein the quality of conveyor belt and its ability to handle grains decide the efficiency of the respective and therefore it is mandatory to invest in the right type of conveyor belt for your requirements. We grain conveyor belt manufacturer know every in and out of the grain handling requirements and also the latest technology and with the banking of the both, we are competent to design and develop an effective grain handling solution to outperform every grain handling task. The offered grain conveyor belt meets all necessary standard regulation of the international bodies and hence assured of highest reliability and safety throughout its lifespan. Our adherence to the quality controlled processes, cutting edge technology and strict quality checks are the grounds, enable us to bring forth such an incredible range of the grain conveyor belts that promises to outperform even under the harshest conditions. Further, the high impact strength along with excellent resistance against corrosion, water, heat, abrasion, chemicals are the notable attributes imparted by selecting the PVC/PU as the material of construction ensures longer life of the grain conveyor belt range. Horizontal, inclined or perpendicular conveying, no matter what your requirement is, we are competent to design the right type of grain conveyor belt for your need that guarantees to make the grain handling job an easy task for you. We can combine anything with the belt with the hot vulcanization technology and deliver the belt with cleat, sidewall, corrugated sidewall, rough top, saw tooth profile or any other profile that can serve you the best and hence we are the first choice of the grain conveyor industries.